Today’s small businesses have more marketing options than ever. The number of tools and apps designed for small business has skyrocketed. From automation and social media management to customer relationship management (CRM) and analytics, the increasing amount of information and capabilities is powerful. But with power, an array of tools and apps to choose from, and rapid changes in marketing trends, comes complexity and uncertainty in knowing which methods and tools are effective and deliver results. Additionally, with rapid change in technology, it can be challenging for small business owners to gain in-depth knowledge about the latest marketing trends and understand which tactics work best for their business. With four years of Small Business Marketing Trends Report data collected, we’re seeing changes in the way small business owners think about marketing. Based on the information we collected, small business owners may be rethinking their approach to marketing and possibly considering a different approach in 2019. Clate Mask has been educating and inspiring entrepreneurs for more than a decade. As CEO, Clate is leading Keap in its mission to simplify growth for millions of small businesses. Clate is a national speaker and contributing writer for Entrepreneur, Inc., AMEX Open Forum, and Small Business Trends focused on entrepreneurship and small business success. He is also the Co-author of the New York Times bestseller, Conquer the Chaos: How to Grow a Successful Small Business without Going Crazy. Donald Miller is the CEO of StoryBrand, and every year he helps more than 3,000 business leaders clarify their brand message. He is the author of multiple New York Times best-sellers, and the #1 Wall Street Journal best­seller, Building a StoryBrand. Don is considered one of the world’s leading experts on the subject of story. Pamela Slim is an author, community builder, and consultant. Pam has advised thousands of entrepreneurs as well as companies serving the small business market such as Keap, Progressive Insurance, Constant Contact and Prezi. She is best known for her book Escape from Cubicle Nation (named Best Small Business and Entrepreneur book of 2009 from 800 CEO Read) along with her follow up book Body of Work. In 2016, Pam launched the Main Street Learning Lab in Mesa, Arizona, a grassroots, community-based think tank for small business economic acceleration. Dennis Yu is the chief technology officer at BlitzMetrics, a digital marketing company. Dennis has been featured in The Wall Street Journal, New York Times, LA Times, TechCrunch, Fox News, and is the co-author of Facebook Nation. He regularly contributes to Adweek’s SocialTimes, and has published in Social Media Examiner, Social Media Club, and Social Fresh. Ultimate Sales Machine (Joey Karam) has assisted over 200,000 businesses worldwide, based on the strategies in their New York Times Best Seller by original author and founder the late Chet Holmes. Today, they assist businesses to double sales through their 12 core competencies on business growth. These experts helped us forecast the 2019 landscape, offering valuable insights on where small businesses need to focus in 2019. Try Infusionsoft by Keap free for 14 days to see how it can help you market your business effectively. In October 2018, Infusionsoft by Keap surveyed a panel of 1,467 self-identified small business owners from across the United States via an online questionnaire. Respondents were not necessarily customers of Infusionsoft by Keap, and the survey did not identify Infusionsoft by Keap as a sponsor. We asked these small business owners ten questions, including a screening question to identify small business ownership. Throughout this report, we outline their responses with charts. While not all respondents answered all questions, we received at least 1,190 responses for each question. More small businesses are being left behind when it comes to digital marketing. In fact, 29 percent of respondents said they won’t be using digital marketing in 2019. Lack of time and resources continues to hinder small business owners with 22 percent of respondents saying this is their biggest challenge. Small business owners are more in the know when it comes to their marketing efforts. Fifty-five percent know whether their efforts are effective, while 33 percent don’t know if they’re working. Social media promotion continues to play a strong role for small business. Forty-eight percent of small businesses plan to use social media as one or more of their marketing tactics in 2019. 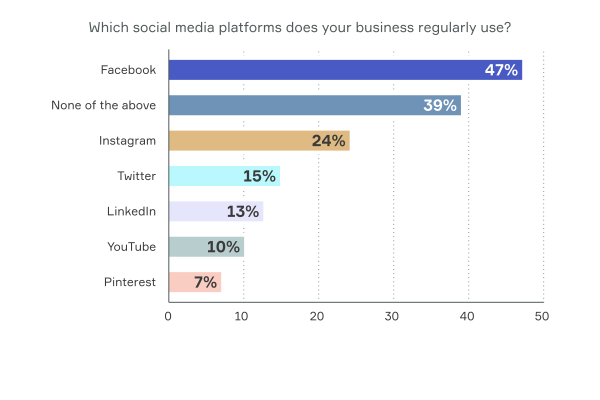 Facebook is still the leading social media platform for small businesses. Forty-seven percent of business owners regularly use Facebook. 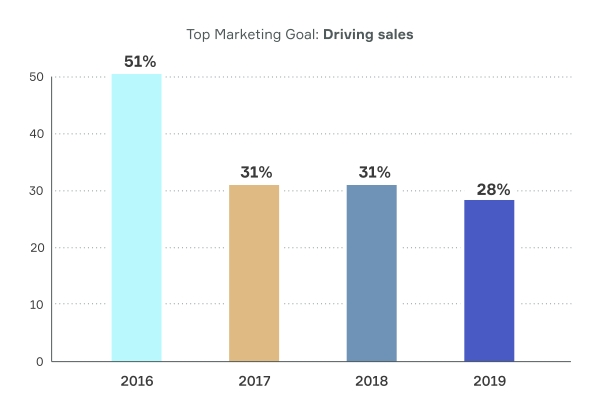 Gaining and keeping clients remains the top marketing goal for small business in 2019. While social media remains the top marketing tactic small business owners are budgeting more for in 2019 (30 percent), a significant number of business owners (46 percent) reported they won’t be spending more on marketing in 2019. This may be a result of more small business owners knowing how effective their tactics are and don’t see a need for investing additional funds towards marketing. It also could be attributed to many small businesses working with a limited marketing budget. Find out what small business owners were saying about their marketing efforts in 2018. 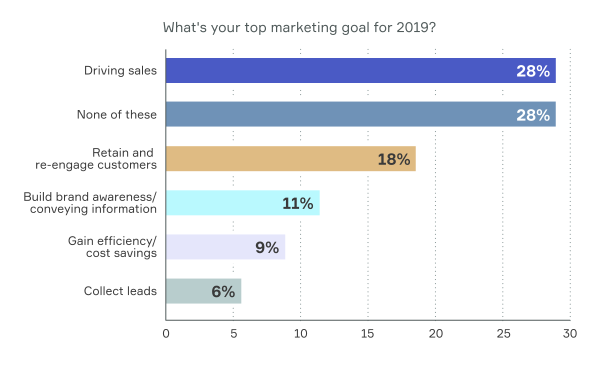 Driving sales is the leading goal for one-third (28 percent) of small business owners followed by a third saying none of the response options (shown below) in the survey fit their marketing goals for 2019. They may be rethinking their marketing strategy because of lackluster results and they’re considering other tactics like personalized customer service or inclusion. 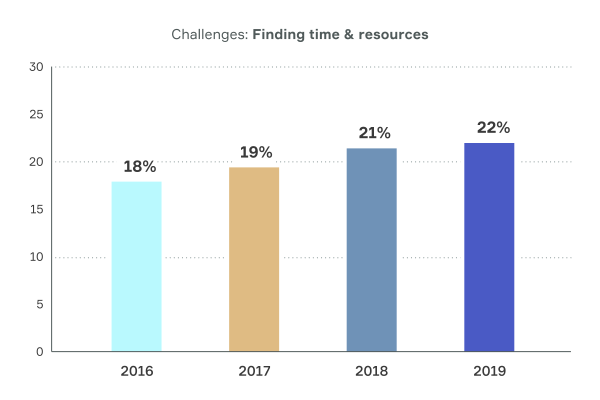 Surprisingly, only nine percent indicated gaining efficiency/cost savings was their top goal for 2019, considering one of the top challenges small business owners face is finding time and resources to do marketing. We’ll take a closer look in the Challenges section of the report. This is one of the questions we’ve asked small business owners for four consecutive years, and the goal of driving sales has remained in the top spot every year. This year came in slightly lower at 28 percent, but taking into consideration a two percent margin of error it’s comparably the same. Finding time and resources for marketing has been the biggest challenge for small business owners. Over the past four years, the number of business owners who see this as their biggest challenge steadily increased. This year, 22 percent (a gradual increase of three percent since 2016) said it’s their biggest challenge in 2019. As we’ve learned from past trend reports, nearly half (49 percent) of small business owners report handling marketing for their business on their own. Pile on top all the other hats small business owners wear, it’s not surprising this is a top challenge for small business owners. 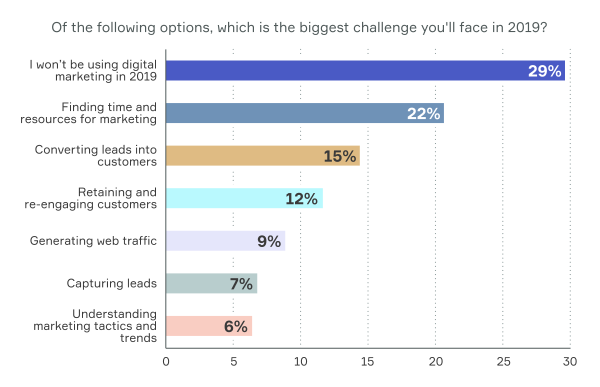 Another interesting result from this year’s survey is that 29 percent of small business owners said they won’t be using digital marketing in 2019 and consider it their biggest challenge. As mentioned earlier, this could suggest they’re reconsidering their marketing strategy to boost its effectiveness, or they’re on a tight marketing budget and don’t realize they can still perform digital marketing on a small budget. As technology advances, so does access to digital marketing data. It’s becoming easier and easier for business owners to gain insight into what’s working and what’s not working. Compared to past years, more business owners reported they know whether their marketing efforts are effective. Fifty-five percent said they know, while 33 percent said they didn’t know. The shift this year, compared to previous years, indicates the growing use of technology among small business owners. 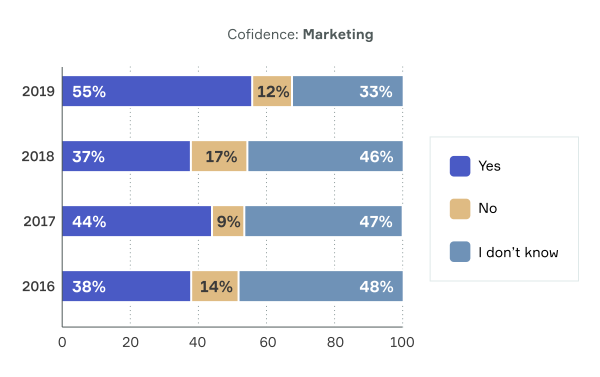 As more business owners adopt technology and gain the benefits, like insight into their marketing efforts, their confidence starts increasing. Small business owners continue to leverage the power of social media in their marketing efforts. 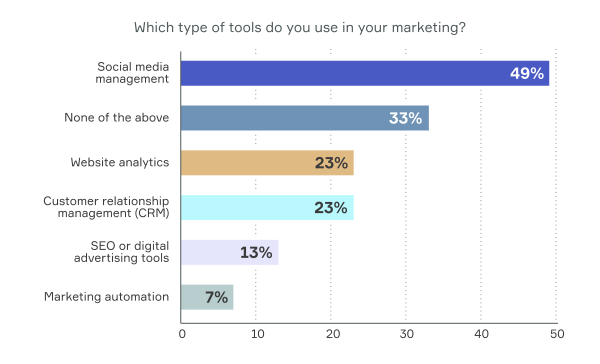 When asked which tools they use for marketing, almost half (49 percent) ranked social media management as their primary tool. Additionally, more small business owners (up almost three percent from last year) are using a customer relationship management (CRM) tool, indicating a growing awareness and necessity to use tools like a CRM to achieve growth. Twenty-three percent said they use a CRM and website analytic tools to help them with their marketing. When asked about marketing tactics they plan to use in 2019, almost half (48 percent) of the business owners said they plan on using social media. 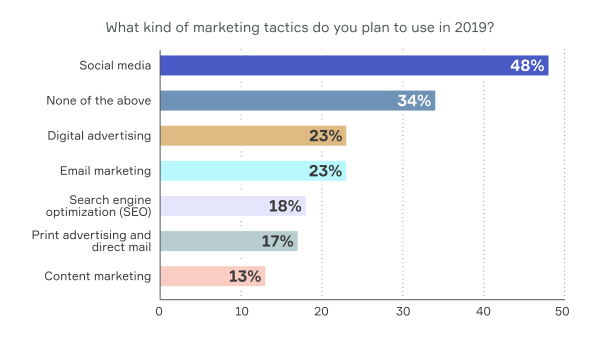 Surprisingly, 34 percent said they won’t be using any of these marketing tactics in 2019. Running a successful small business is challenging, and failing to invest in marketing, or having a marketing plan in place, will make it harder to survive in a competitive market. We recommend going through an annual strategic planning exercise to prepare for the upcoming year. Small business owners surveyed this year said they plan to boost spending on social media with 30 percent planning to increase their budget in 2019. Other areas small business owners plan to budget for are website analytics (14 percent), CRM (13 percent), and email marketing services (13 percent). 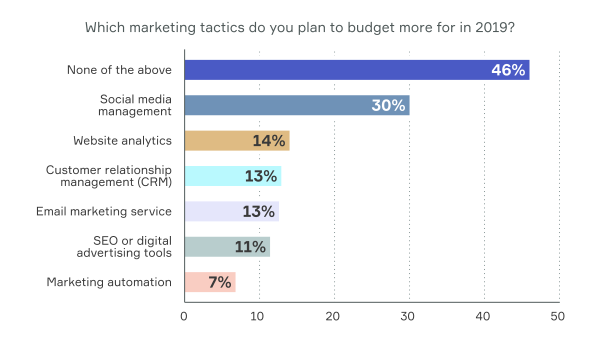 Nearly half (46 percent) of small businesses owners said they won’t budget more for any of these marketing tactics in 2019. This can be an indication that an increasing number of small businesses are on a tight marketing budget and can’t afford to invest more in digital marketing. However, there are steps small business owners can take to successfully market their business on a small budget. There are free software solutions and low-cost ways of marketing that can help small businesses with limited resources. The only downside to using multiple tools, is that it can lead to challenges with productivity and proper management of client and lead information across multiple platforms. CRMs help contain the chaos which can quickly creep into a small business juggling various tools. More and more business owners are realizing the benefits of using a CRM. As we mentioned earlier, 13 percent plan to increase their investment in 2019. 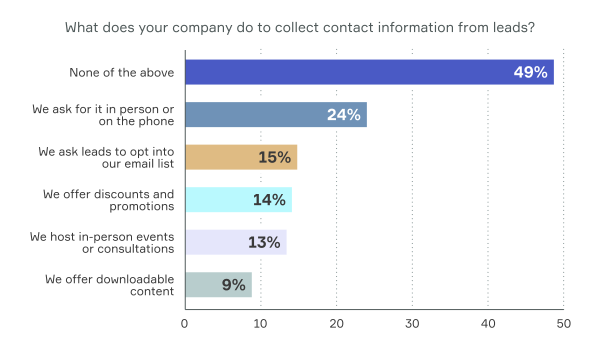 We asked small business owners what they’re doing to collect contact information from leads and almost half (49 percent) selected none of the above. While this response received a higher ranking compared to last year, it may be an indication that small business owners who responded to this survey aren’t doing anything with the contact information they’re collecting because they’re wearing multiple hats and don’t have time to keep up. Unfortunately, many small businesses encounter this problem and leave numerous missed opportunities on the table. Asking for contact information in person or on the phone came in as the next top response with 24 percent of business owners saying this is the method they use. As in past years, small businesses rely heavily on in-person or phone interactions to collect contact information from their leads, especially service-based businesses. A small percentage of business owners said they’re using digital marketing tactics like email opt-ins or asking leads to opt into their email list. Using digital tactics in conjunction with a CRM can provide the personalized experience clients demand while ensuring leads aren’t missed or forgotten. 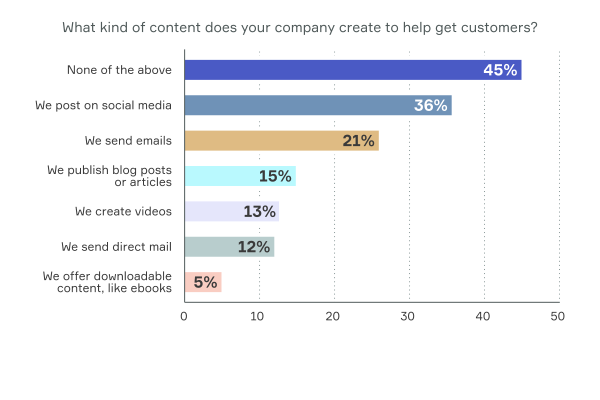 Small businesses continue to see success from social media and it still ranks as the top method of content small businesses acquire new clients. However, a significant number of business owners (45 percent) said they don’t create any of these pieces of content. Small businesses that don’t incorporate content marketing into their marketing strategy are losing opportunities. The cost-savings alone is worth the time and effort that goes into content marketing. In fact, content marketing costs 62 percent less than traditional marketing and generates 3 times more leads. Content marketing continues to prove its value into 2019, especially for small businesses with a small marketing budget. For three years in a row, Facebook remains the top social media platform small businesses regularly use. This year, 47 respondents said they use Facebook, followed by 24 percent saying they use Instagram. Notably, Pinterest usage dropped almost 50 percent from last year down to seven percent saying they use it regularly. Facebook continues to be the number one choice for small businesses despite the increase in new social media channels because it offers the largest platform for consumers. It just makes business sense—businesses that use social media are able to reach a broader range of potential clients, connect with their audience, and share relevant content. Looking to make more sales next year? If so, you need to set better goals. Take a look at the top seven sales goals for 2019. Struggling to find time and resources is the biggest challenge hindering small businesses, which is a clear indication that small businesses need to find ways to improve efficiency and adopt changing technology and tactics. We spoke with marketing leaders and small business experts, including Infusionsoft by Keap's CEO, Clate Mask, to see which trends they think will impact small business in 2019 and what small business owners can do to maximize success. “It's an exciting time of innovation for businesses of all sizes, especially small businesses. Trends like AI, machine learning, and voice technology can be extremely beneficial and are becoming more accessible by being built-in to the backgrounds of apps and tools small businesses already use to run their business. What I see happening in 2019 revolves around one word: simplicity. With the use of AI, things like automation will become easier to use because the technology is automatically doing the work people once had to do and spent hours on end trying to figure out. Now, the data is simply there driving smart automations that perform the right task at the right time. Based on our findings, a large number of small business owners state lack of time and resources as their biggest challenge—something that hasn’t changed from previous years. By choosing products with AI built into them, small business owners will be able to save time and take a more targeted approach to marketing because they no longer have to spend hours trying to hunt down the data or try to make sense of it—AI is managing it all for them in the background. Additionally, things like voice technology have changed the way we search for just about everything. I recently read a report stating that digital assistants will reach more than 7 billion devices by 2020. Voice combined with AI will help small business owners become more efficient and organized while on the go. Capabilities that were once impossible without opening up your laptop, like logging an important note while on a service job or sending an invoice to a client, can all be taken care of by speaking into your mobile device—and as a result, have more time to focus on other areas of their business. “The best marketers of 2019 will know all of the formulas and have mastered the basics, but they’ll also be able to forget them. When people buy things, they’re not acting as perfectly rational human beings. The best marketing is overwhelmingly human and speaks to the emotional aspects of our decision making. What challenge do you help your clients overcome? How are you helping them become the person they want to be? When we answer those questions, we invite clients into a story! When a person feels like they can trust you—when they truly feel you’re guiding them to a successful outcome—they’ll follow your lead. Because you’re offering more than just a product or a price point. You’re offering them transformation. And if the marketing aspect of your job feels uninspiring, you may have lost sight of this key truth. And you’ll see savvier marketers in 2019 passing you by. In my book Building a StoryBrand, I teach readers how to clarify their message using the proven methods of effective storytelling. The same formulas used to create major motion pictures can be used to create dynamic marketing that resonates with clients. Once someone learns the framework, we help them create a messaging BrandScript that’s specific to their business. Know the formulas, and then create something that is unique to your brand. As marketers and entrepreneurs, we have formulas, too—the proven templates that work for business plans, web pages, org charts, sales copy, email campaigns, and more. Formulas will produce good work. They can also get you into trouble. As a marketer, you need to know the formulas. And when it comes time to do the work, then you’ve got to get creative with them. Break them, reinterpret them, forget about them. Let them exist in your subconscious, but obey the artistic flow of whatever it is that you’re trying to create. Then come back to it, using the formulas again as a guide for changes that you might make. If you don’t master the formulas, you can’t play around with them. But if you follow them to the letter, you’ll never create stand-out marketing materials that resonate with people personally and set your brand apart. “Many small businesses get stuck in a rut marketing the same way to the same sets of clients for years on end. This is why launches start to fizzle, campaigns stop working, and eventually, businesses lose money and relevance. One way to make sure that your marketing is poised for the future is to look into the demographics of your clients. Are your products or services, marketing campaigns, and networking activities focused on every possible client in your community? If you’ve been coasting in a zone of sameness for marketing, now is the time to begin to expand your ecosystem. Relationships take time to build. Don’t make the mistake of just slapping a new photograph on top of your old campaign. Spend time with people in new communities. Ask about the companies and campaigns that are well-respected, and why. Test new ideas with small groups before going big. Be prepared to get it wrong. Then, make it right. It’s impossible to be perfect when connecting with people from different backgrounds. You will make mistakes. Learn how to take feedback without getting defensive. Apologize sincerely and quickly if you do mess up. In the long term, your willingness to learn and engage despite discomfort will earn you trust. Pay for insight and expertise. It’s common to ask a peer from a particular community to do a bunch of free labor reviewing materials and copy, referring a number of qualified experts to speak at events, or to provide lots of examples of places where you can market. This is real work that should be paid to a professional who has expertise and connections in these communities. “As we look at the state of business finance in 2019, there are trends that have gained momentum with small businesses and are poised to explode in the next 12 months. One of the trends I see that could explode in 2019 is how businesses are increasingly going cashless. Of course, ecommerce businesses operate entirely without cash already, but we’re seeing brick-and-mortar national chains, as well as local small businesses, take paying with cash out of the equation, as plastic and digital payment options become more ubiquitous and easier to facilitate with mobile devices and digital point-of-sale systems. Going cashless marries the streamlined, secure convenience of paying with a card with the reality that people are increasingly moving away from cash and prefer businesses who accept cashless payment methods anyway. Use of cash, especially for purchases above $10, are falling sharply, and though there are concerns about leaving out unbanked or underbanked populations, this is likely the direction we’re headed in as a society. Another important move I see happening is the continual shift away from desktop-based accounting software towards online, cloud-based software as small business owners are seeking opportunities to streamline their workflows so they can work more efficiently. This is a smart move for small businesses—cloud-based accounting software such as Quickbooks allows business owners to collaborate with their bookkeepers and accountants more easily while integrating with hundreds of other related applications covering workflow, bookkeeping, scheduling, and other helpful tools. There is greater flexibility, security, efficiency, and transparency with these cloud-based platforms. Finally, one area I’m watching closely to see if 2019 is ‘the year’ for this trend is how businesses can more effectively utilize cryptocurrency. Cryptocurrencies like Bitcoin have some unique upsides that other payment options can’t touch, such as better rates and the power to avoid chargeback fraud. Recently, some lenders have allowed borrowers to collateralize their loan with cryptocurrency as well. The use cases for crypto are growing—but will businesses find them useful? “In 2019, we'll see a dramatic shift to AI-powered business, as the major networks abstract complexity away from the end user. The movie recommendations from Netflix, posts you see in your Facebook newsfeed, and driving directions in Google Maps are all examples of machine learning working behind the scenes in our daily lives. The amount of data these networks have is staggering. Even in 2001, my team at Yahoo! was collecting 13 terabytes of data per day via search logs. And our crawlers were indexing 100 million web pages a day. Seventeen years later, we can only imagine the volume being collected today. AI-driven algorithms are not just powering your Uber ride, but critically impact your ability to drive sales. We'll discuss practical steps you can take to win from the algo changes, instead of getting penalized. Set up our digital plumbing.Getting our various pixels on our website (Facebook pixel, Google analytics pixel, Google ads pixel) integrated for remarketing, and having solid conversion tracking in place. In short, the more data we can feed into the machine, the better job it can do in identifying who is most likely to be a client, then bring these people to us. Choose ROI-based objectives.Knowing exactly what a client is worth at every stage of our funnel is critical for our ads, analytics, and marketing systems to be able to detect and fix anomalies automatically. We used to play ‘needle in a haystack’ in our analytics by running various combinations of reports, hoping to spot something wrong. Now, we can set triggers in Google Analytics as well as Automated Rules in Facebook Ads, for example, to spot and correct issues without human intervention. For example, you could set a rule to increase budgets if you're getting more than a 500% return on advertising spending (ROAS) on a set of products in your shopping cart. All modern marketing automation systems and landing page builders now have built-in split testing (also known as A/B testing) and attribution tools, automatically re-allocating traffic to winners. “Today we live in a world oversaturated with information leaving consumers on perpetual guard, and having the biggest resistance to marketing and sales. They receive 32-85 push notifications from their phones each day, bombarded by an average of 121 emails, all while trying to manage their job. No wonder 8 out of 10 business professionals are stressed. We’ve become devoured by the noise. It’s so loud that breaking through the clutter is extremely difficult. The majority of small businesses today are relying on advertising “hacks” and “shortcuts,” which everyone else is using. It’s ludicrous to think that someone else's’ funnel, website, or Facebook Ad will be the miracle remedy for your success. (Leave marketing hacks to the spammers and noise). The only way to survive in 2019 is to stop marketing, and start authentically educating. This means you’ll need to deliver true value to your clients. To put it simply, the client comes first, and the product you create or service you provide must be so amazing that it will obviously solve their needs. That’s how marketing needs to be done in 2019. Spend your time delivering value, innovating ways to give your clients better results, retaining clients, giving them support that blows their minds, and being remarkable (marketing). Then, and only then, discover tools and tactics that can help you spread your message (advertising). In our New York Times best-selling book, The Ultimate Sales Machine, we call this being a strategist. A strategist slaughters the tactician every time. A tactician will look for hacks and quick remedies to get the sale, while a strategist will look for the nine objectives they want to solve for every client interaction. Would you like to just make a sale? Or, would you like to gain their trust? Be known as the most knowledgeable in your field? Inspire your clients to refer more clients to you? You should have nine different strategic objectives with every touch. Because of dishonest practices, consumers are researching more than they ever have in the past. Prospective clients are researching an average of five pieces of content from you before they even inquire to speak to you or your sales team. They’re looking for authentic, raw, and honest companies. In fact, our studies show that impromptu videos do better (most of the time) than a video that is highly polished and edited. People like to see behind-the-curtain before they buy. They like to see glimpses of humanity and humility instead of a static brand. Take a further step back in time. Download our 2017 Small Business Marketing Trends Report. As marketing technology advances, so does access to data. It’s becoming easier for business owners to gain insight into what’s working and what’s not working. We saw that in the shift in marketing confidence in this year’s survey. However, the majority of small business owners are still struggling to find time and resources for marketing. While small businesses may be taking the right steps to adopt digital marketing and new technologies, they may not be using the right tool and tactics, or they’re using multiple tools and apps, which ends up consuming more time and resources. With so many choices and rapid changes in marketing trends, knowing which tools and apps work best can be challenging and leaves many small business owners wondering which methods and tools are the most effective and deliver the best ROI. When faced with many options, small business owners may not realize that CRM and smart automation tools likeInfusionsoft by Keap are available to help them achieve (and even exceed) their goals and provide them with insight into the effectiveness of their marketing efforts and help them save time by automating their daily tasks. Wondering if Infusionsoft by Keap is right for your business? Sign up for a demo to find out.